« 3rd Best Gift Shop in Western Washington! 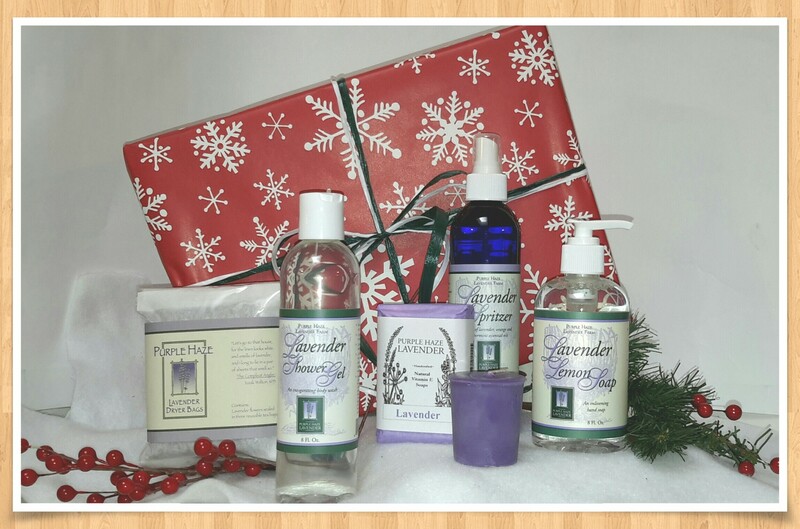 This year for the holidays we have put together a couple of great Christmas Gift Boxes filled with Purple Haze Lavender products. What a perfect time of year to send a box full of lavender to the “lavender lover” on your list! Our special Christmas Gift Sets come all wrapped and ready to place under the tree, just add your own personal gift message when you place your order and we will do the rest! Our “Let it Snow” Gift Box comes filled with our most popular items for your bath and home. The Dryer Bag will make your sheets smell like a field of lavender, the Shower Gel is refreshing, our soy Lavender Votive is made with the essential oil distilled at the farm, the Lavender Bar soap is long lasting and natural, the Lavender Spritzer was our very first product 19 years ago, and our Lemon Lavender Handsoap is a bestseller….perfect for the kitchen or bath! This box is like sending a little piece of the Purple Haze Farm right to their front door! All of the products are full sized and made on the farm by our wonderful workerbees! The “Culinary Delights” Gift Box is perfect for those folks who love to cook or eat! Purple Haze Lavender Salad Dressing is not only good for your salad it makes a wonderful marinade or a great dip for veggies and bread! Our Herb de Provence Mustard was added this year to the National Mustard Museums Catalog-they thought it was amazing! And our Lemon Pepper is perfect for fish or chicken dishes. The Lavender Scone Mix is easy and yummy to make….there is nothing like fresh scones and butter on a cool winter morning! For the cook who has yet to try lavender, the Lavender Recipe Folder is filled with recipes and the Culinary Lavender Florets and Herbs de Provence needed to make each of the recipes inside! Of course you may always make up your own gift boxes as well, just choose your items, add gift wrap to your order and we will put it all together and send it on it’s way!